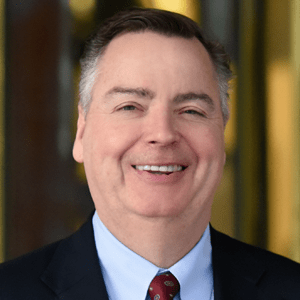 Berkery Noyes Represented The Thomson Corporation In The Sale Of Centerwatch And New England Institutional Review Board To Jobson Medical Information - Berkery, Noyes & Co., LLC. 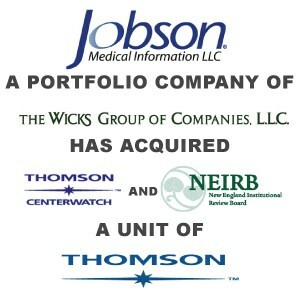 NEW YORK, January 4, 2008 — Berkery Noyes announced today that the firm represented The Thomson Corporation (NYSE:TOC; TSX: TOC) in the sale of CenterWatch (“CW”) and New England Institutional Review Board (“NEIRB”) to Jobson Medical Information, a portfolio company of The Wicks Group, LLC. Terms of the transaction were not disclosed. Founded in 1994, CenterWatch is a trusted source and global leader in providing proprietary data and information about clinical trials to both professionals and patients. As a pioneer in publishing clinical trials information, CenterWatch was the first Internet site to publish detailed information about active clinical trials that could be assessed by patients and their advocates. The NEIRB division provides FDA mandated services to pharmaceutical companies and Contract Research Organizations (CRO’s). Founded in 1988, NEIRB was one of the first central institutional review boards established to meet the ethical review needs of a burgeoning drug development market. “Both CW and NEIRB are winning franchises in the healthcare market and both have high caliber management and employees,” said Tom O’Connor, the Berkery Noyes Managing Director who managed the transaction on behalf of The Thomson Corporation. “Within Jobson Medical Information portfolio these assets can grow and expand,” added O’Connor. Berkery Noyes acted as exclusive financial advisor to The Thomson Corporation on the sale of CenterWatch and NEIRB. Berkery Noyes has been involved with many of the most notable transactions in the healthcare, pharmaceutical tools and services, and medical marketing sectors involving both strategic and financial buyers and sellers. About Berkery Noyes- Berkery Noyes is one of the pre-eminent merger and acquisition firms serving the information industry, having completed more than 400 transactions since its inception. Among the most recent transactions completed by Berkery Noyes are the sale of HMP Communications to Alta Communications in partnership with Paul Mackler and Ken Fisher, the sale of Complete Healthcare Communications to MediMedia a portfolio company of Vestar Capital Partners, the divesture by The Thomson Corporation of American Health Consultants to Thompson Publishing Group; acquisition by Springer Science + Business Media of Current Medicine Group; acquisition by WebMD Corporation of Conceptis; acquisition by The Wicks Group of DesignWrite, Inc. and the acquisition by Veronis Suhler Stevenson of Facts On File.